Astro & TPP users have a 5GB standard quota on their home directory due to limited resources on the file server. Users can request for this to be increased to suit their requirements. NFS storage is used to provide the /home and /research filesystems. These are designed to be used as filers for persistent, valuable data, and not for direct cluster job I/O. All user home directories (/home) reside on NFS shared storage. Each user will have a home directory on only one of the 3 NFS servers. Home directories are not visible to other users and as such are intended for your own personal storage, not for collaborative storage (for that see sec-research-areas). Currently only PACT users on darshan are have home directory quotas of 5GB (which can be increased if necessary), but this is something you will be introduced to by your department’s sysadmin. Other users do not have direct quotas, but your usage will be monitored and you may be asked to reduce your usage should it become a problem for other users. The first point is critical. Every user talks to one of the 3 NFS servers exclusively, and these servers consist of one large RAID6 device, meaning that I/O bandwidth and latency to this device is shared with all users of that server. If a user or job starts to do a large amount of I/O to their /home or /research areas, they will effectively monopolise I/O to this server having a very large and noticeable impact to all other users of this server. For example, other user’s shell sessions will start to have a large amount of lag. Everything under /research are the research storage areas, and these are also mounted from the NFS servers. The purpose of this space is, similar to the /home space for persistent, collaborative data, such as a shared group code-base or data set. Write access to these areas is controlled by department or research group however, so if you or your research team doesn’t have an area here then do request one from us. Similar to the /home filesystem, there are presently no quotas applied to the research filesystems, apart from for PACT users. We ask that you use this space sensibly, and if you have significant group storage needs (anything larger than ~ 100GB) then get in contact with us to discuss your Data Management Strategy. 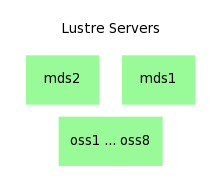 Lustre is composed of a redundant pair of metadata servers (MDS1 and MDS2), along with a large number of object servers (presently 8, with 2 more to come online in the near future) that actually hold all the data. Lustre is mounted under /lustre/scratch and should be the target of all job or heavy I/O when using the cluster. Unlike the home and research filesystems, Data on lustre has no guarantee of persistency – it will live as long as the filesystem does, but there are no backups as the filesystem is too large to realistically backup. We do not currently clean up old files automatically, instead relying on our users to sensibly clean up after themselves on lustre. However we reserve the right to make this request of people should the need arise and to ensure that sufficient scratch space is available for other users. Lustre is a open-source, parallel file system that is designed for the needs of HPC users. There is presently (Sept 2014) 270 TB of Lustre storage (see Hardware for up to date figures), with an additional ~200 TB to be installed in the near future. this will tell give you your usage in kilobytes. As mentioned above, Lustre is provided as scratch space, so we ask you all to not leave files on Lustre indefinitely as this wastes storage space for other users on the cluster. All important data should be transferred over to the Research Storage Areas at the earliest opportunity. No guarantee of data persistence – NO backups should the filesystem fail. Fast, parallel filesystem designed for many users and multi-threaded/multi-process workloads. Lustre is a parallel filesystem, which primarily helps support I/O from multiple jobs not block each other. For speed however, Lustre is more optimised for high throughput I/O rather than low latency I/O. The reason for this is due to it’s architecture, as an I/O request from a process first queries the Lustre metadata server to get a list of object servers and data locations for where their data is stored, and then to contact the object servers for the data itself. Thus Lustre may not be the fastest for reading and writing lots of small files. Lustre shines however if you want to stream in very large datasets to processes as you can take advantages of lustre’s lustre_striping feature to distribute your file across multiple object servers, and then stream data to/from all of these servers concurrently, thus achieveing much higher I/O bandwidth as you can write at speed proportional to the number of object servers (or technically the number of object storage targets which counts each block device attached to an object server). For low-latency I/O, see the section on Local Scratch Partition (particularly if you are not doing MPI jobs, or don’t globally available storage that is present on all the nodes). Lustre has the ability to stripe data across multiple object storage targets, which can greatly increase the I/O bandwidth obtainable. Chapter 25 of the Lustre Manual (direct link to PDF) covers this topic in much greater detail, but I will try to summarise a couple of key points below. Higher bandwidth - If your application requires high-bandwidth access to a single file, then without striping you are limited to the I/O bandwidth obtainable from a single object storage target (which in reality is a single RAID6 device) and by the capacity of a single network link (Infiniband at QDR ~40Gbs). With striping you can stripe this file across a large number of object storage targets to get the aggregate bandwidth of all of these disks. Massive files - If your file is too large for a single object storage target (the largest for us is ~27 TB and the smallest is about ~9TB) then you will need to stripe it across targets. Increased latency - striping across more object storage targets means more network operations to more hosts on the newtork. Striping small files is therefore slower and more inefficient than not-striping them. The manual linked above is the definitive source for doing this, so please have a quick look there. Below are some simple examples. # OSTs. The --count -1 means stripe over all OSTs. There is a small amount of local scratch space on all compute nodes in the cluster that can be used by jobs and may offer improved I/O latency when doing lot’s of small I/O (reading and writing to lot’s of small files for instance). This space varies in size from node to node, but is usually >220 GB. The cluster will make available an environment variable $TMPDIR that you can use from within your job scripts to address this area, so you should always use this, but for reference the current path is /local/scratch. It is also nearly always only a single physical disk (no RAID), and is just a simple non-parallel filesystem (EXT4 usually), thus the latency benefits above may disappear on a busy node if lots of people start hitting the space. However you are welcome to experiment with this space if you find your I/O workload could benefit from this. This space get’s wiped on a node reboot. If you do this, remember that this scratch space is local to the node you are running on, therefore you will have to manage staging-in and out whatever data you will want to read and write from this area manually yourself. As the cluster is a shared resource, it is vital for all research groups to have an overview of what and how their members are using the system, particularly when it comes to storage. Storage on the cluster has been bought by various departments according to their needs and then pooled so that everyone can benefit from the increase in resources. However as this shared space becomes tighter there will be greater pressure for groups to justify their storage usage. If your research group require a lot of storage space, then it is important to talk to the HPC admins early on so we can come up with a strategy and also make collect quotes for costs for potential new hardware needed to be bought if that is required. You need to have an idea of what your temporary storage needs are and what your persistent storage needs are, and for what length of time you will need the data. This information will influence what we recommend as the best storage media for your usecase. For example, if you have very large data sets to be archived, then we could budget and arrange a tape-storage archival pipeline. Or if you need more frequent access to research data, then we can look at buying more NFS servers for your needs.